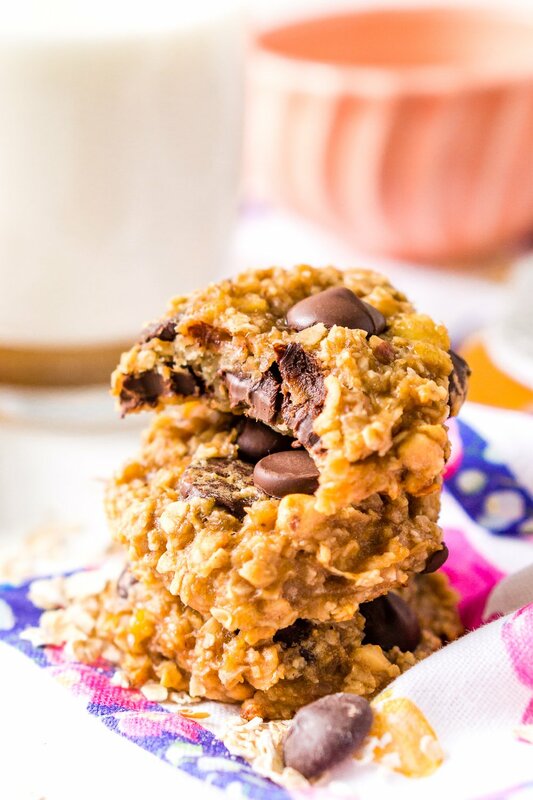 These 3-ingredient Banana Oatmeal Cookies may be the healthiest, easiest cookie recipe you’ll ever make! 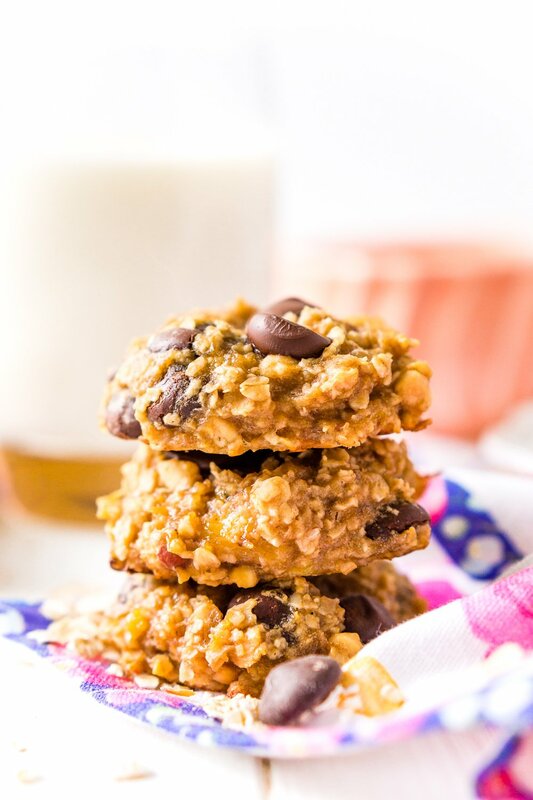 Banana, oatmeal, and peanut butter make the basic version of this moist and chewy treat, or you can add your own mix-ins like coconut flakes or chocolate chips! 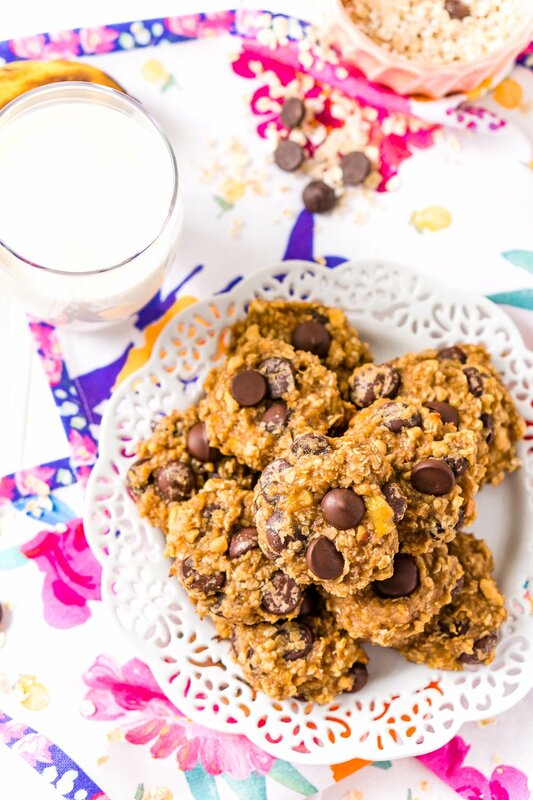 When you hear the words “Banana Oatmeal Cookies” and “just 3 ingredients,” your first reaction might be: “Yes, please”! … well, 4 if you want to add chocolate chips. But a batch of Banana Oatmeal Chocolate Chip Cookies is totally worth that fourth ingredient, right? This recipe is wholesome, delicious, and so simple, your little ones will love helping you make it. There’s no added sugar, but (shh!) the kiddos don’t need to know that. 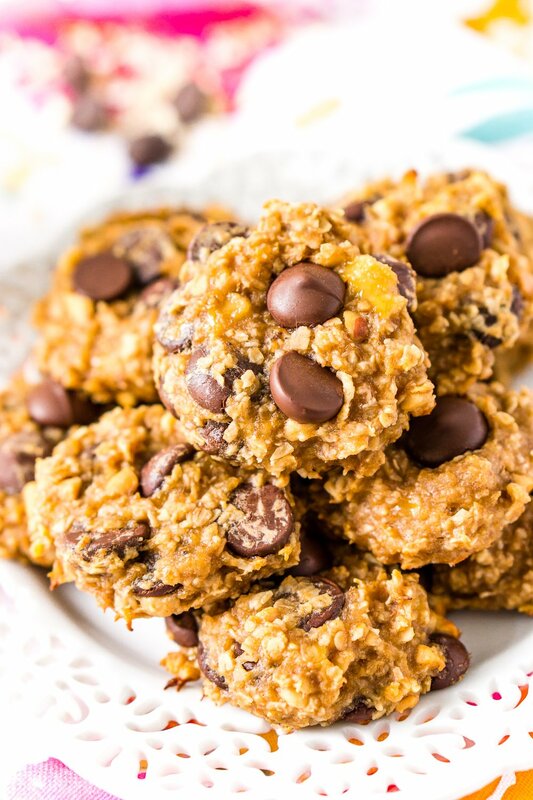 The base of these Banana Cookies is made with ripe bananas, 1-minute oatmeal, and chunky peanut butter. Mix together, bake, and you’re done! 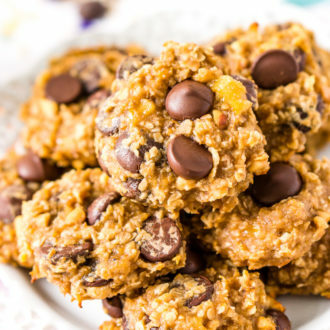 These make great Breakfast Cookies too! 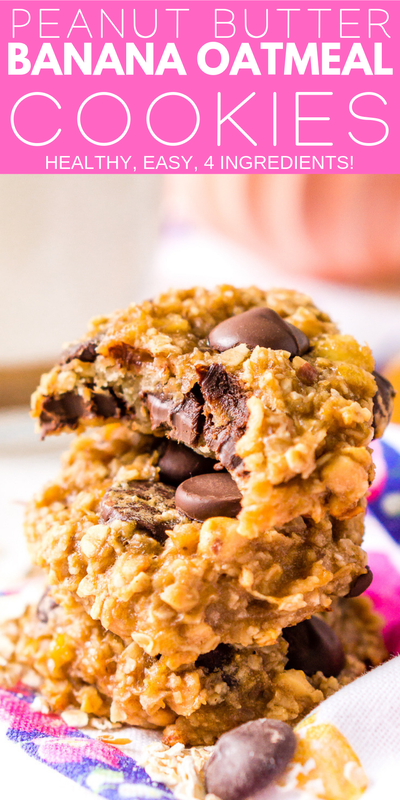 These hearty cookies are actually a great source of protein and fiber. They’re also perfect for families with members who have food allergies or sensitivities to dairy, gluten, or eggs. Do you ever find yourself rummaging through your pantry after being hit with a sweet tooth? You can whip these up with ingredients you probably already have in your kitchen. Or, maybe you just want a healthy, yummy treat on hand! 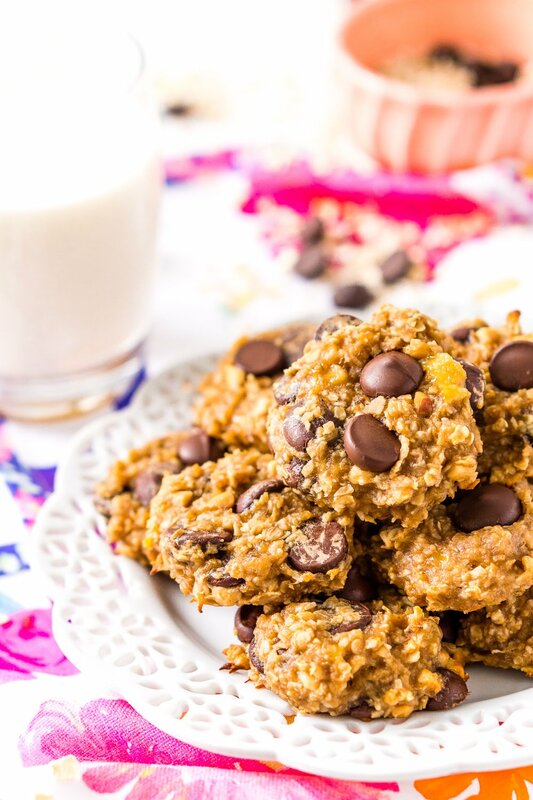 Peanut Butter Banana Oatmeal Cookies are under 100 calories each and make a satisfying snack with a glass of milk. I enjoy snagging one or two of these for an energy-boosting snack. They also make a great breakfast cookie, and sometimes I snag one or two in the morning with my coffee. Go ahead and tell your family they can have these cookies for breakfast. What they won’t know is that they’re basically eating a bowl of oatmeal, peanut butter, and bananas on the run! Another thing I love: you can add your own mix-ins to this simple cookie recipe. My favorite is chocolate chips, and you can even use the dairy-free kind if you want. You can also try adding nuts, dried fruit, or shredded coconut. Basically, whatever is in your pantry works! 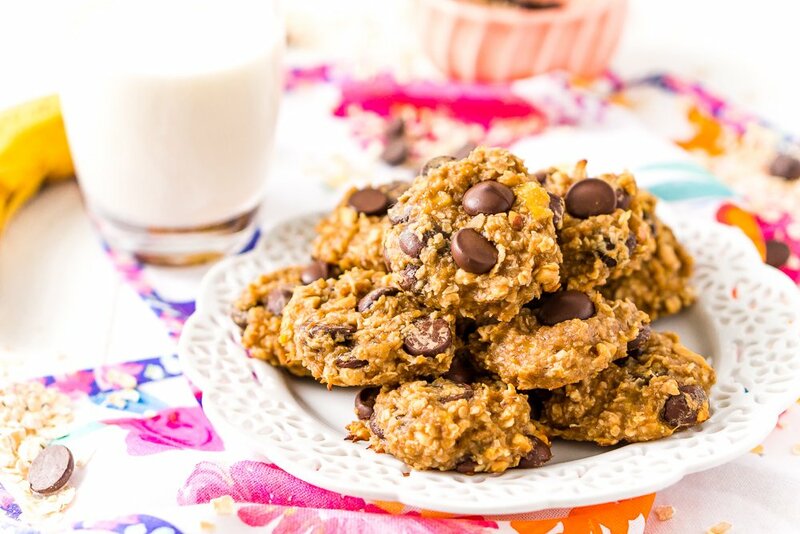 All-natural and wholesome with just 3 ingredients, Banana Oatmeal Cookies are a healthy treat. Make a big batch, and feel good about sharing these with your family (or just enjoying them yourself)! Preheat the oven to 350 degrees F and line a large baking sheet with parchment paper and set aside. In a large bowl, mash the bananas with a fork until only small lumps remain. Add the peanut butter, oatmeal, and chocolate chips to the mashed banana and mix until evenly combined. Use a medium cookie scoop to measure heaping scoops of the cookie dough onto the prepared baking sheet. Use your fingers or palm to gently flatten the cookies. Bake for 15 to 17 minutes, remove from oven and allow to cool on the baking sheet for a few minutes before transferring to a cooling rack to cool completely. Nutritional information is an estimate per cookie including chocolate chips.